The moment the sunlight falls on Pangong Lake; its crystal clear water refracts a band of violet, blue, green, orange and red colors which can be observed on the surface appearing like a tinted canvas. Pangong is 40 miles in length and nearly 2-4 miles in width at a height of 4267m above the sea level What strikes the eye in coming first in view of this lake is the lovely colour of its water, espacially towards evening, which is of the richest deep blue, over the whole expanse, at morning time, it is of a lighter a very brilliant colour. The water of the Lake is not that salty as sea water. A long narrow basin of inland drainage, hardly six to seven kilometers at its widest point and over 130 km long, it is bisected by the international border between India and China. Spangmik, the farthest point ot which foreigners are permitted, is only some seven km along the southern shore from the head of the lake, but it affords spectacular views of the mountains of the Changchenmo range ot the north, their reflections shimmering in the ever-changing blues and greens of the lake's brackish waters. Above Spangmik are the glaciers and snow-capped peaks of the Pangong range. Spangmik and a scattering of other tiny villages along the lake's southern shore are the summer homes of a scanty population of Chang-pa, the nomadic herdspeople of Tibet and south-east Ladakh. The Pangong Chang-pa cultivate spares crops of barely and peas in summer. It is in winter that they unfold their tents (rebo) and take their flocks of sheep and pashmina goats out to the distant pastures. 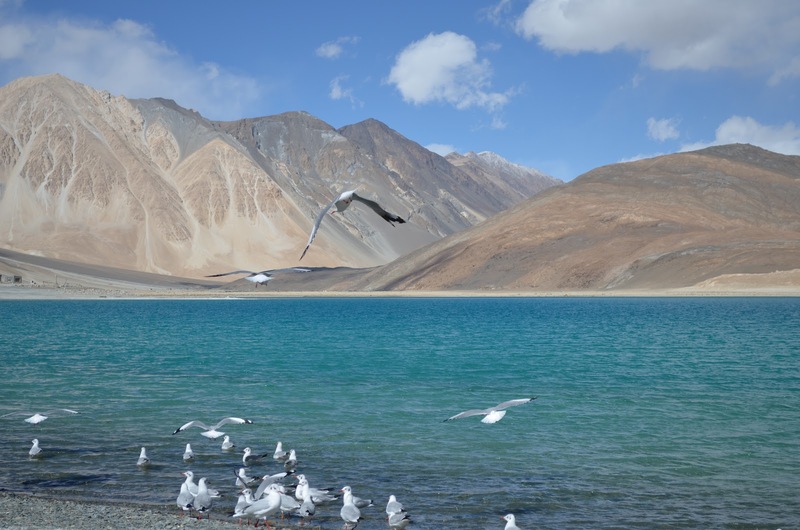 Pangong Tso trip can be organised in two days and overnight stay at Tangtse.Travellers are not allowed to pitch their tents near the Lake and only allowed to go upto Spangmik due to security reason. As 75% of the Lake is in China and only 25% is in India.The landscape on the way to Pangong is spectacular.